At one point in time, I wasn’t that great at designing cabinets. Even after creating several cabinets, I still have manufacturing defects in every finished product. the best cabinet I ever built as far a quality goes was the one that was covered in fuzzy carpet and had the corners covered with plastic edges. As I get more advanced with cutouts, I’m doing better at some things, and I’m still making mistakes while learning the new skills. The cabinet design that I chose for this amp was similar to the 5E3 amp cabinets, but I wanted mine to be slightly smaller. Hindsight being 20/20 on this: I could have probably opted for a slightly larger cabinet; The parts (speaker and transformers) are going to be in very close proximity to each other. When I say close, I mean dangerously close. When all is said and done, there will only be a few hundredths of an inch clearance unless my estimates are off a bit. I’ll really find this out once I purchase the parts and start my dry fit. I originally drew this cabinet to match the dimensions of a cabinet that I found in a Google search. 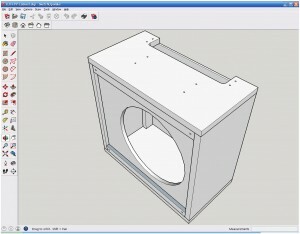 Using Google SketchUp, I made each part of the cabinet and then fit them together. I decided I wanted to have a smaller amp, so I shrunk the dimensions and moved some stuff around. Even the image above has some parts in the wrong place. When I moved stuff the last time, some holes were shifted in the wrong direction. I didn’t let this hold me back. I went ahead and built the cabinet despite my drawing being a little off. I had a clear enough picture of what I wanted that I could make the final calls with the saw in hand. I was sure to measure more than once before cutting. This is another one of those tasks that drawing it by hand might be easier than trying to figure out how to use a CAD program. If you do draw by hand, be sure that all of your measurements are logged. Do the math to make sure everything works out fine. you’ll still have to do this even if you use a computer to do the drawing for you. Handles, feet, casters…you’ll want these! Tube locations…think “HEAT!” Keep ventilation in mind. I believe that the parts layout into their functional sections on a circuit board is one of the most challenging parts of tube amp construction. I tend to put a great amount of thought into this camp, and I usually have a few kinks that have to be worked out in the end. The toughest part is when I get crosstalk that causes oscillation. Hopefully I have learned enough lessons over the years that this one actually works as planned. The chassis and parts layout happen at about the same time for me. I used Inkscape to do the layout. 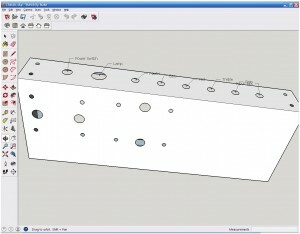 Here’s the information that it takes to make this happen: part values, part dimensions, a schematic, and anything else that will help you draw a rough sketch of the layout. In Inkscape I drew squares for the part sizes as looking down on the circuit board. I started with my turret board and then populated it with the parts as I followed them on the schematic. I started with the power supply on the right side, moved to the preamp, phase splitter, and finished with the power amp. 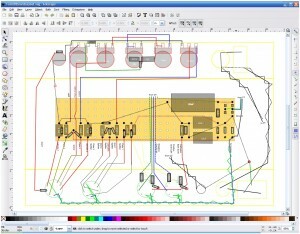 Then I checked the schematic and rough bill of materials to make sure all the mounted parts were taken into account. Mounted parts include transformers, circuit board, pots, jacks, switches, tube sockets, and any fasteners. While the layout was made I was sure to take into account any wires that crossed. I tried my best to keep in-phase signals close and out-of-phase signals far, far away. Anything out-of-phase would need to cross at 90 degree angles and preferably at as much distance as possible. Once the Inkscape layout was created, I used Google SketchUp to model the chassis. It isn’t difficult to make a 3D model of the chassis. You make the metal part, and then you measure and draw holes where you’ll drill it. Piece of cake. 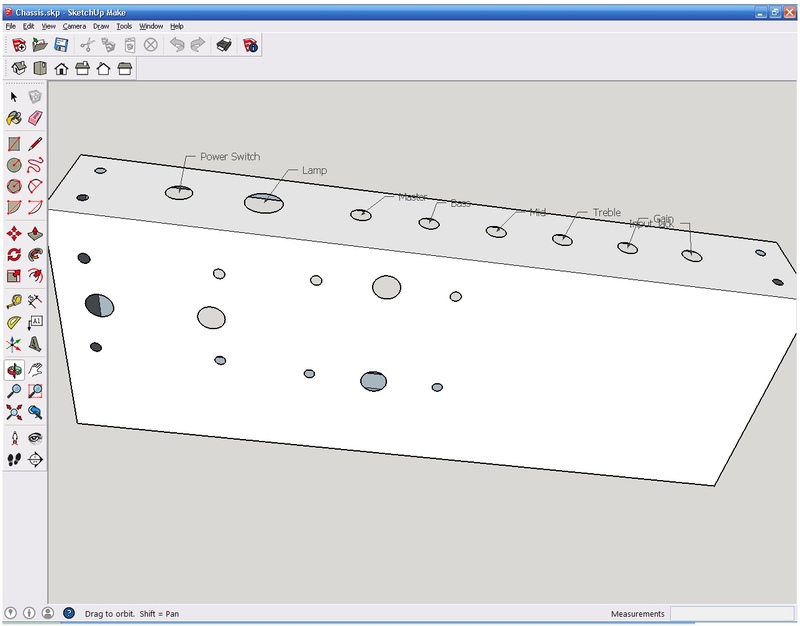 This way I am able to use that model to punch and drill the chassis with accurate measurements. There may be a way that would suit you better such as pencil and paper, but I like to use computers as much as I can. 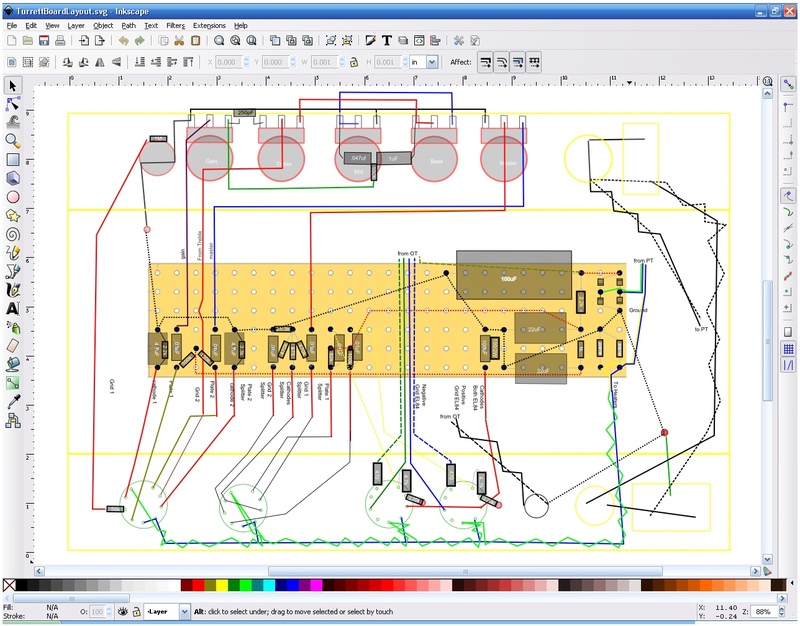 I understand that it might seem like a huge hurdle to try and learn a complicated CAD program to do layouts when you could easily do it on paper. Whatever method that you use, be sure to do a dry fit before drilling holes in a twenty dollar chassis. This is time consuming on a first run, but it’ll save you some heartache in the end. This was one of the more difficult procedures for me to figure out, and I think I might have given in a little to the “it looks like the book so I’ll roll with it” mentality. I understand that it is designed just like a regular preamp gain stage, but there seemed to be a little magic that I couldn’t quite grasp. Despite that, I know that this section is pivotal to the push-pull output stage, so I had to dive in eventually. I saved this section for last because I wasn’t ready to wrap my mind around it yet. Now’s that time. Using The Valve Wizard again for this, you can read up on it with me by using the link in this sentence. 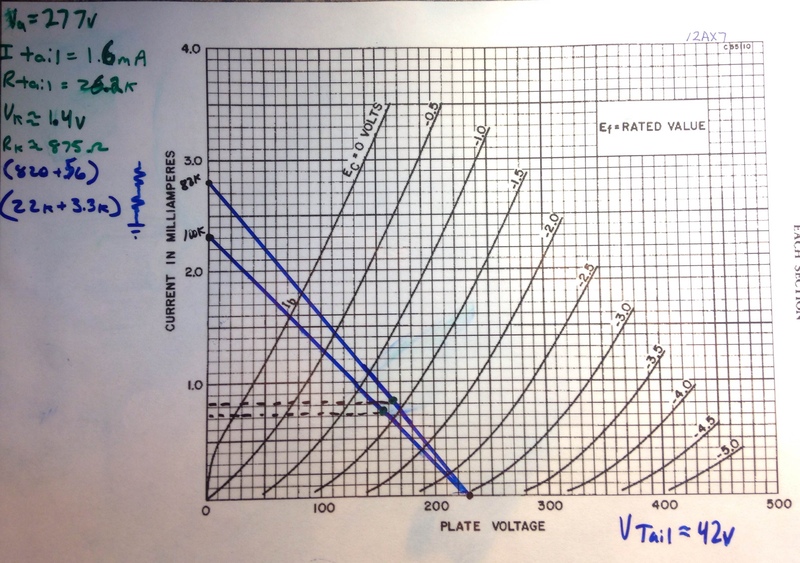 The first thing to do is devote some voltage to the tail. I don’t have a high voltage power supply in my design, so I don’t have as much as I could give it. I figured that having 235 volts for the anodes would be sufficient, and since I have a 277 volt supply, this gives the tail about 42 volts. I picked the 82k and 100k resistors for the anodes based on many common designs. This gives me 2.8mA and 2.3mA respectively. 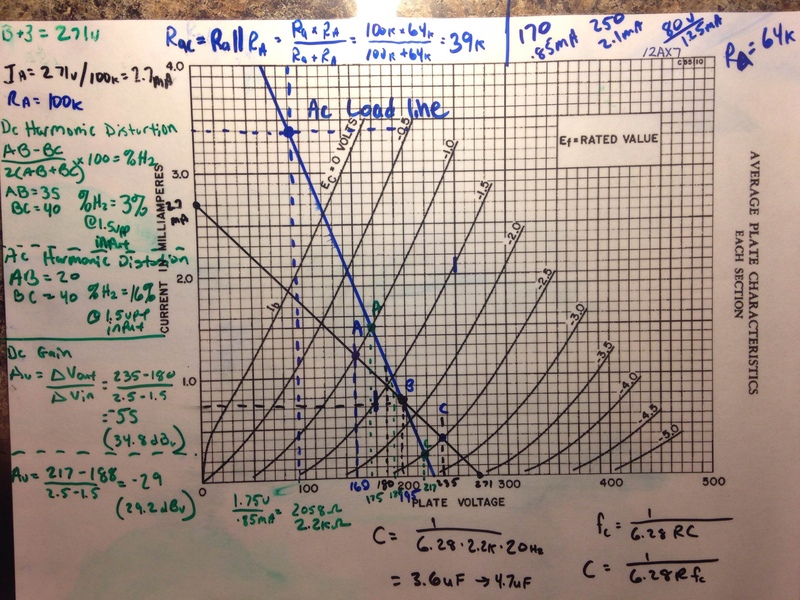 Now I can draw my load lines from these point to 235V and find a bias point. The grid resistors are 470k ohms, which since there are two this gives an input impedance of almost 1M ohms. The DC blocking caps at the input are chosen to be .01uF to satisfy the -3dB cutoff at 20Hz. You can see The Valve Wizard’s calculation and explanation of this. I usually start with my preamp when designing an amp, but for this particular project I decided to go in reverse order. I am fairly familiar with the preamp design, so I decided to tackle the power amp first since I didn’t have much experience with a push-pull style tube amp. We’re in part 5 of this series where I outline the steps that I’ve taken to arrive at my final design, and now I’ll show you how I designed the preamp and tone stack. I used Duncan’s Tone Stack Calculator to design the tone stack. I’ve used a couple of different tone stacks over the last few years. My favorites, so far, are the Fender and Big Muff tone stacks. For this amp, I really want a versatile tone stack so I’m going with the Fender style tone stack. It uses three potentiometers and three capacitors, so there’s an added cost to this stack when compared to the Vox or even the Big Muff style tone stacks. I also have to take into account the real estate that the three pots will take up on the amp’s control panel. 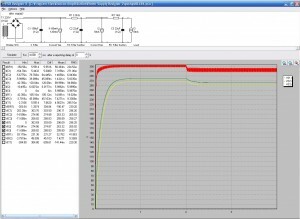 Using Duncan’s TSC, much of the calculations and guesswork is cut to a short process. I used the stack as-is. In the image above, I show you what a flat response looks like with the bass and treble turned down and the mid cranked to ten. In this configuration, the treble acts as a gain knob, but only boosts frequencies above about 500Hz. The flat line gain (or loss) of this stage is -20dBv. I’m happy with this design. This is the labor intensive part of our design. There are too many choices to outline in this short blog article. Most of what you can do with preamps can be studied in the books and links mentioned in the first part of this series; research should always be your first stop when designing anything. The information that I’m sharing is the results of the calculations that I learned from Valve Wizard’s Common Gain Stage document. Go ahead and download this and read through it. The calculations in the images won’t make much sense without it. I started my design by selecting a plate resistor. I’m keeping this design fairly run of the mill for this design. Sometimes I break rules in my designs to see what happens (like small plate resistors), but I’m not going that route this time. For the first stage I chose a 100k ohm resistor. There are countless other amps that do this very thing. 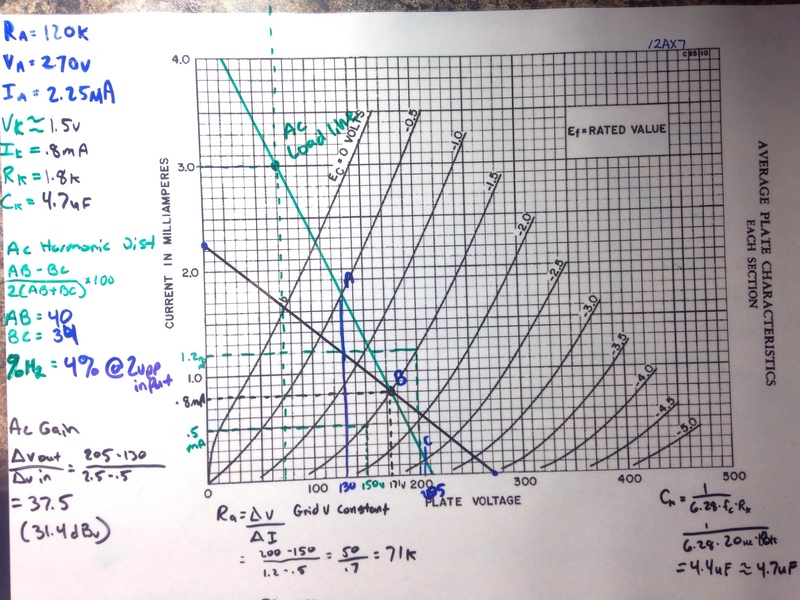 Now I’ll use the load line to calculate the other part values; The load line will run between the 2.7mA and 271V segments on the graph. Now I need to find my operating point. 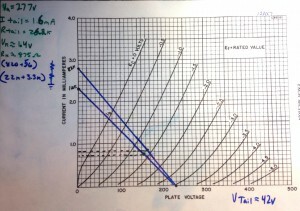 I’m choosing an operating point for my cathode voltage to be around 1.75V. When I draw a line from this operating point, I’ll find my quiescent operating current. 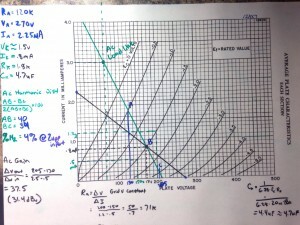 Then I can calculate the cathode resistor needed to achieve this goal. The cathode resistor will be a standard 2200k ohm resistor. The bypass capacitor is calculated as 4.7uF. The second stage is designed in the same way. 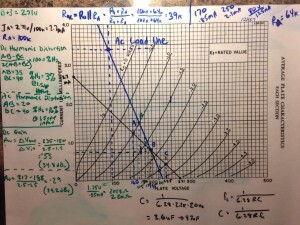 I’ll choose the anode resistor first, then I’ll calculate the rest based on the results. I chose a 120k resistor which should give me a slight increase in gain and less harmonics. The second stage was calculated several times based on different operating points. I started with a 2V cathode voltage, but later changed it to 1.5V after finding that I didn’t like the AC load line at 2V. Choosing the cathode voltage to be at 1.5V gives me a little more room for a 3Vp-p signal to avoid clipping. this stage will clip, and it is meant to clip. 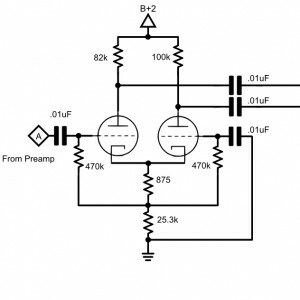 The first stage when driven by a 1Vp-p signal will have a 28Vp-p signal from the output into the tone stack. Turning the tone close to max would allow most of this to stage 2. It doesn’t produce any extra volume at that point, but it does alter the waveform of the original signal substantially. The next stage to design for the EL84 push-pull amp is the phase splitter that will drive the two tubes in the power amp. I didn’t go to great lengths to design this section since there were many designs that fit the bill. After part 6, the amplifier circuit design will be complete. Part 7 will show how I do the chassis layout and turret board design. Part 8 will show how I designed the cabinet. So far everything I’ve done has required no purchases! I’ve spent $0 at this point designing my amp, and it has provided many hours of fun (work). A design like this, including layout, usually takes me 40 to 60 hours. I spend a lot of time with the math, and then I spend a considerable amount of time using Google Sketchup and Inkscape drawing up inch-by-inch diagrams to make sure the layout is perfect. There’s nothing worse than rushing something just to find out that you can’t fit a chassis in the cabinet because a power switch is in the way. Part 9 is where I’ll start spending money. Part 9 will probably be the cabinet build. Part 10 will show the chassis drilling and fabrication stage. Part 11 will show the turret board and chassis stuffing. Part 12 will show the initial power up; Part 12 will be interesting because if anything goes detrimentally wrong, this is where I’ll probably get hung up. Stay tuned. I’m attempting to meet a project completion date of Jan 15, 2015. This is due to the budget needed for this design and the time needed to complete the stages. I started this project around September 1, 2014. Stay tuned. So far I have done my tube amp building research, defined what I want out of my amp, and I’ve designed my power amp. 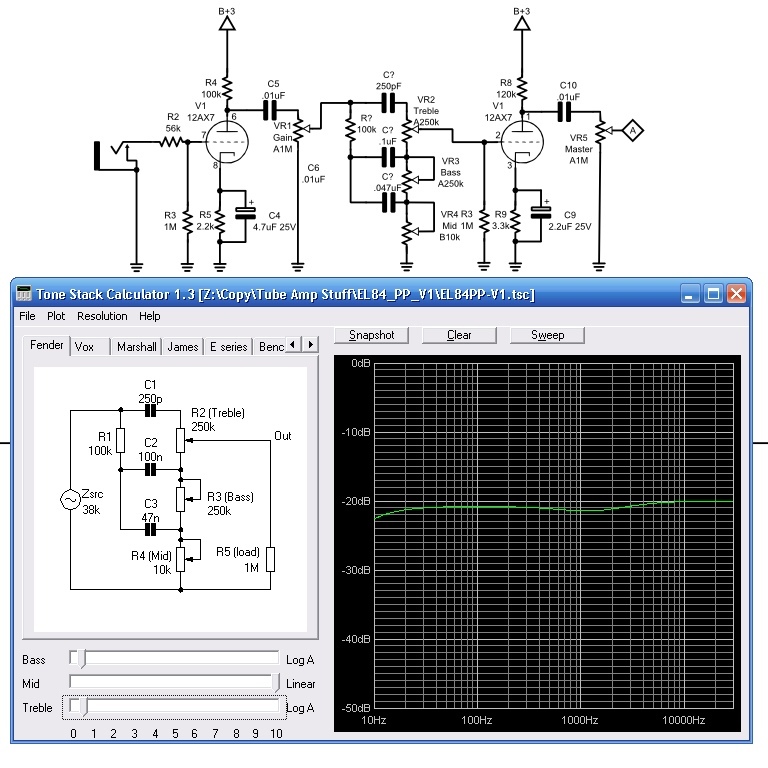 Before I go any further, I need to design a power supply to see if my amp design is possible. The steps involved aren’t difficult, but I’ll spend some time doing a little math, playing with Duncan’s Power Supply Design program, and doing a little shopping. I’ll be using power supplies from EdcorUSA. Their quality has always suited me well despite the lead time, and I haven’t had one fail. You can’t get things cheap, quick, and quality all at once. First I need to find out what kind of power transformer that I’ll need. I want a 300V DC minimum 120mA output, so I’ll need a power transformer that has a 300V/1.414 = 212V AC at 140mA. I also know that the heater supply will need to support at least 760mA+300mA+300mA = 1.36A at 6.3V AC. After searching through the Edcor catalog, I arrived at the XPWR152 which is perfect for this. I’ll use a full wave bridge solid state rectifier. I know from the load line that my power amp idles at 60mA. Under max usage, this will vary, but from my understanding the inductance of the output transformer can handle some of that without stressing the power supply. I also need to take into account that the 12AX7 tubes will also draw current, and so will the grids of the power tubes. The XPWR152 is rated at 200mA for the HT, so I believe it will be cool as a cucumber for this. The rest of the design is done in Duncan’s Power Supply Design program. Check out the image to see how I set it. 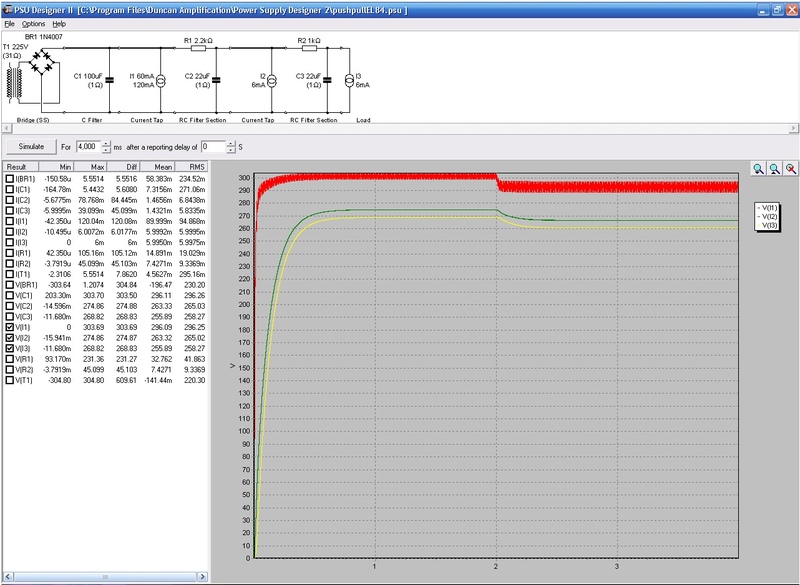 This shows me a pretty good assumption of how my power supply will react. To keep costs low, I used a combination of a C filter with two RC filters. The I1 current tap is B+1 for the power amp. I2 is B+2 for the phase splitter, and I3 is B+3 for the preamp. 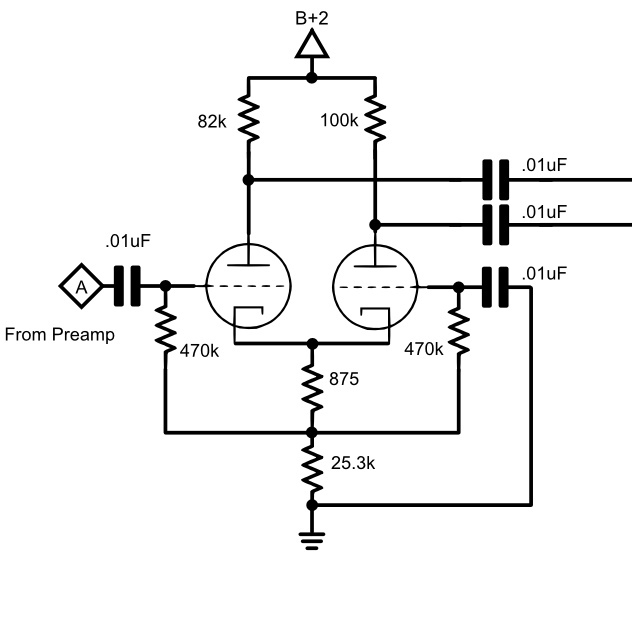 Since the push-pull power amp rejects common mode noise, a large ripple is acceptable for B+1. I have 8V ripple on B+1, and I could probably go with a smaller capacitor on B+1, but I am happy with the result. Just keep in mind that largecaps at huge voltage ratings equals big money. The heater supply is the most simple part of the project. I will have a 100 ohm resistor as a false center tap. This gives it a ground reference. 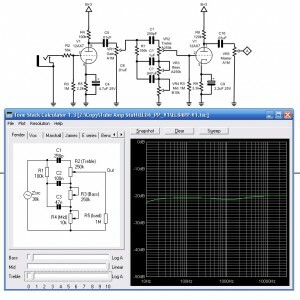 It took quite some time for me to get familiar with how to work the power supply design program. I did quite a bit of research to figure it out. Here’s where things get a little crazy as far a assumptions go. What size fuse do I use on the primary side of the power transformer? According to “The Art of Electronics”, this value can be assumed based on the current on the secondary. My understanding is this: secondary current is multiplied by the ratio of secondary voltage to primary voltage. These currents can then be multiplied by 4. This is your primary fuse rating. A 2A 250V fuse will work just fine. The next step of the way is to design my preamp. Part 5 will be dedicated to a simple way to design and build a preamp. It can be complicated, but I choose to ignore certain criteria. I’ll probably make an attempt to do some of the complicated math, but I’ll try not to bore you with it. Some things can be worked out in the testing phase when everything is fully assembled. Changing a plate or cathode resistor to dial in sound is fairly easy. Since this is a first run working prototype, I expect things to change.